Some of comedy’s hottest names have been busy working on new sitcom pilots for BBC iPlayer, airing in September, with the hope of these creative projects later being picked up for a television series. First up is The Coopers Vs The Rest, a depiction of the turmoils of adopting within a modern day family, with its difficulties involving fitting in with other families, or getting along with other parents. This young family in particular has a very interesting dynamic, with mum Tess (played by Tanya Franks) and Frankie (Erin Kellyman) partaking in consistently sarcastic back and forth that has the warmness of love still beneath it. The dialogue is quick and often unexpected, with each character giving as good as they get, even little eleven-year-old Alisha. Other pilots include Chris Fewtrell and Simon Crowther’s Home From Home, which follows the Hackett family as they move to their new lodge at Lake View Holiday Park. With Johnny Vegas playing the lead (father, Neil Hackett), supported by Joanna Page as wife, Fiona, this narrative is one of unspoken judgements and stupid faux pas, making for fraught and funny viewing. Next up is Julie Thacker Scully’s latest writing project, Our Ex Wife, which features Robert Webb’s trademark cutting and sarcastic narration throughout. Although a completely different concept to Peep Show, Webb’s idiosyncratic style of self-commentary still really works within the sitcom format, with the tensions between Jack (Webb), fiancé Sara (Melanie Lynskey) and Jack’s ex wife Hillary (Victoria Hamilton) providing relief from the gruesome slasher elements that punctuate the episode. Co-written by Helen Linehan, Graham Linehan, Sharon Horgan and Holly Walsh, Motherland is a sitcom that is arguably concerned with the politics of parenthood rather than the essence of childcare itself. Every now and then there is something undeniably funny to be found from shocking or unexpected self-centeredness in human beings, and this feeling is epitomised in this pilot episode about ego-fuelled mothers who, understandably, want to rid themselves of responsibility whenever possible (and this is, of course, hardly ever possible at all). From the opening scenes it is very much like a disaster movie, with working mother Julia (Anna Maxwell-Martin) frantically rushing to get her young children to school on time, only to realise it is half term anyway and she will have to take the day, and potentially the week, off work. Motherland is an excitingly stressful and busy watch, but Diane Morgan provides important relief from the tension, with her acerbic nonchalance ironically providing much of the drama. 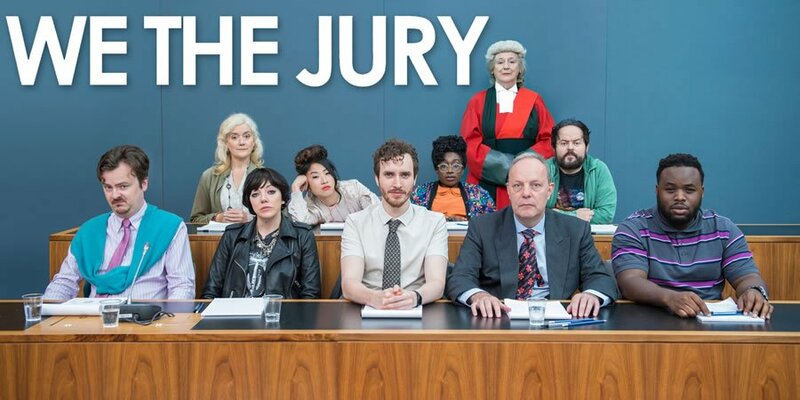 We The Jury is the standout piece for me from this recent batch of sitcom pilots; written by James Acaster, it is reminiscent of his 2015 show Represent, which sees the comic share the ludicrous tales of a recent jury he claims to have taken part in (fictional, undoubtedly). This gradual development of an idea gives the programme a homemade, organic feel, therefore giving an audience the impression of far more depth to the narrative and the characters within it. Acaster has smartly captured his own comic voice within the script, without the need to be physically present (all bar a few unexpected seconds anyway). Visually, We The Jury is bright and snappy, reflecting the excitable energy of the characters, which, somewhat surprisingly, doesn’t grate. There are many interesting characters that Acaster has not had time to establish within a pilot episode alone, from Sophie Thompson who plays Jen 1 to Diane Morgan’s laid back Olivia, proving that this concept could easily develop into a series without any particular risk of stagnancy.